Amavasya, also Karutha Vavu, is the no moon day in a Hindu Calendar. Amavasya Vrat is observed for the welfare of dead ancestors, parents and other relatives. People observing fast on the day only take a single meal. It is believed that by observing the vrat family will attain peace and prosperity with the blessings of ancestors. The popular belief is that Pitrus (dead ancestors) receive the light of the moon on Amavasya night. Therefore the day is ideal for performing Shradh, Tarpan and Tila Tarpan. Bathing in holy rivers and performing the rituals is highly meritorious. The rituals on Amavasya day is dedicated to all dead people in the family. When Amavasya falls on Monday it is known as Somavara Amavasya and Hindus should perform vrat, holy bath and Daan (charity) on this day. Devotees also should do pradakshina (going around) of Peepal Tree for 108 times on the Somvar Amavasya day. The single meal on Amavasya day is usually taken after sunset. The fast should be performed when Amavasya Tithi is there during sunset. The rituals should be performed only when Amavasya Tithi is there during the morning hours. The rituals vary from community to community and from region to region. But a Hindu must remember that the method is not what matters nor the elaborateness of the ritual. 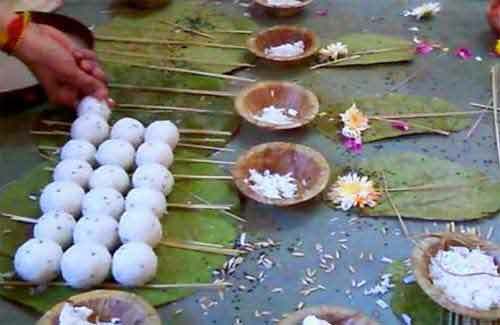 Remembering the ancestors, lighting a simple lamp with devotion and offering a few grains of rice is all that is needed. We are here because of them.